My fellow bloggers have recently written about their Ballard and Capitol Hill neighborhoods. 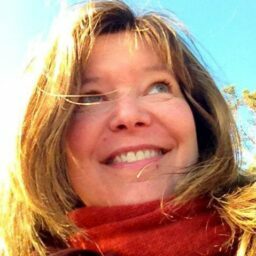 So in the spirit of a little friendly throw down, I’m here to talk about the virtues of mine — West Seattle. Autumn at Lincoln Park. Photo by T Wickersham. 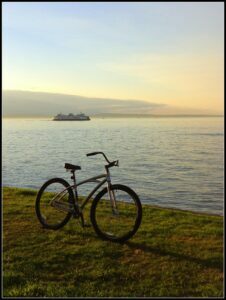 The oldest and largest of Seattle’s neighborhoods, West Seattle is, according to History Link, “both a peninsula and a state of mind.” It’s true, we West Seattleites are a pretty proud bunch, and think we live in the best part of Seattle. If you’re visiting Seattle and looking for a slice of neighborhood flavor once you’ve taken in all the points of interest in the city core, I not-so-humbly suggest you put West Seattle on your list. Alki Beach. Photo by T. Wickersham. One of Seattle’s only long stretches of sandy beach is also the site of the original Seattle settlement by the Denny Party in 1851. 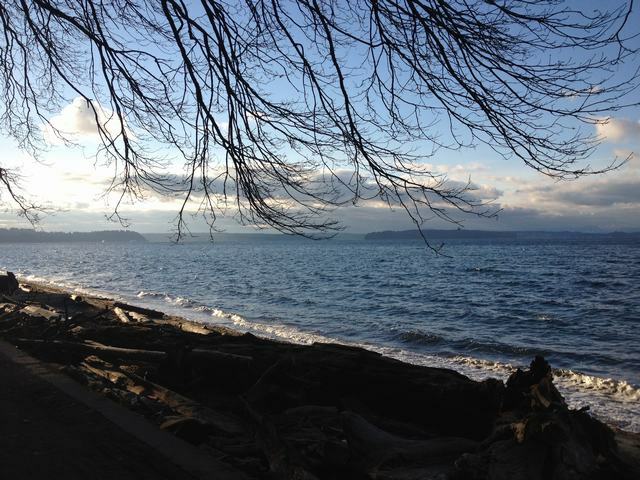 Alki Beach also offers some of the best views back across Elliott Bay to the city skyline. 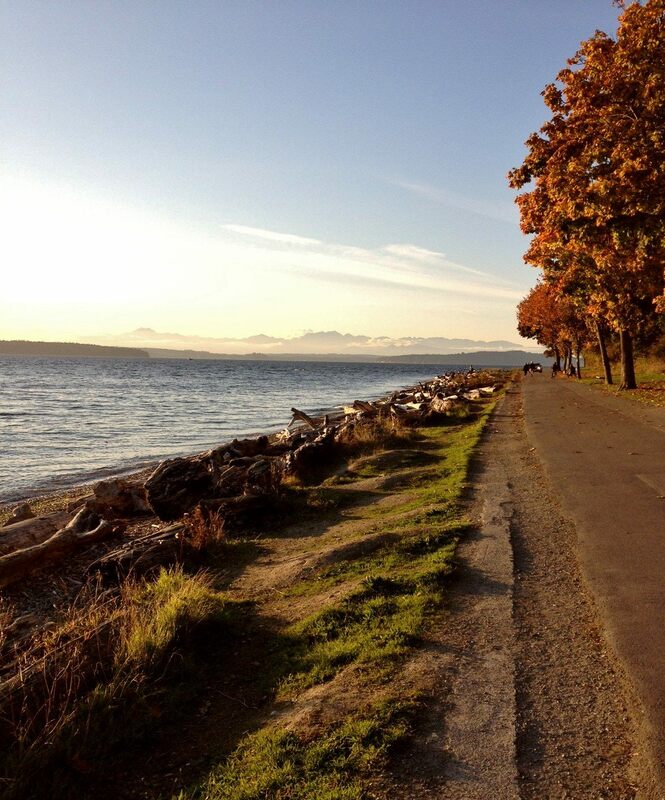 So you’ve got beauty, outdoor recreation and Seattle history all in one spot. Not to mention a nice selection of friendly restaurants, cafes and bars along the beach. 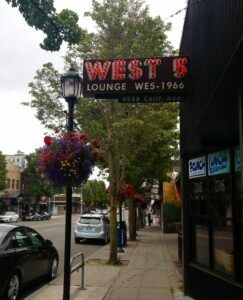 West 5 in the West Seattle Junction. Photo by T. Wickersham. Click! Design That Fits showcases the owners’ beautiful handcrafted jewelry along with carefully curated home goods, and I can never escape the junction without browsing through one of the friendly and well-stocked used bookstores. A neighborhood institution since 1932, the legendary Husky Deli is known for homemade ice cream and piled-high sandwiches. Enjoy some of Seattle’s best sushi at Mashiko, and the award-winning chocolates and pastries at Bakery Nouveau. West 5 and Elliott Bay Brewpub offer refreshing libations and tasty grub. Are you sensing a theme yet? With so many cities full of chain stores and restaurants, West Seattle shines with a unique collection of local shops and eateries….and a great sense of neighborhood. Lincoln Park water path. Photo by T. Wickersham. Moonglow Anemone at Constellation Marine Reserve Park. Photo by Beach Naturalist Lisa Keith. 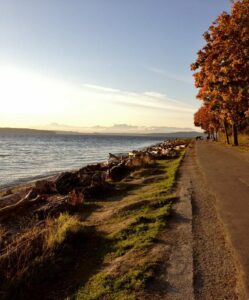 Further south, one of my favorite West Seattle places is Lincoln Park. 135 acres and one of Seattle’s largest parks, it sits on a bluff above Puget Sound just north of the Fauntleroy Ferry Terminal. Quite diverse, the park includes rocky beaches, a flat trail along the water, grassy forests and meadows with play and picnic areas, more than 4 miles of walking paths and a seasonally open outdoor heated saltwater pool. 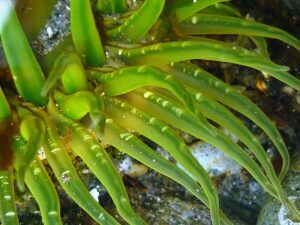 A great way to explore Seattle’s sealife is with the Seattle Aquarium Beach Naturalist program, where on select low tide days, trained volunteers will guide you in exploring the beach areas. Check the website for upcoming 2013 Lincoln Park dates. Nearer the West Seattle bridge, the Duwamish Longhouse is also worth a stop. This traditional cedar post and beam structure designed in the Puget Salish Longhouse style opened in 2009. A small collection of artifacts introduces the culture and traditions of the First People of metropolitan Seattle, the Duwamish Tribe. 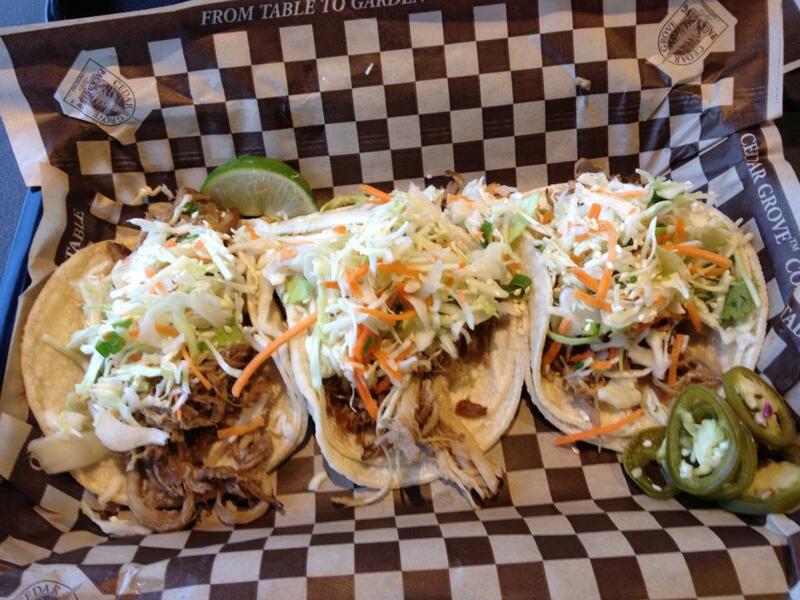 Spicy pork tacos from Marination Ma Kai. Photo by T. Wickersham. Several King County Metro bus lines also serve West Seattle. The West Seattle Junction Association is a great resource to plan your visit. And for all your West Seattle news, the West Seattle Blog has it covered.